‘dancing & doughnuts’ virtual world tour: interview with Rachel Kovaciny! Today on the blog I’m honoured to interview Rachel Kovaciny. She’s the author of the newly released novella, Dancing & Doughnuts, which is a Western retelling of the classic (but little known) fairy-tale ‘Twelve Dancing Princesses’. Rachel is a talented writer – read this interview to learn some cool things about her and her stories and then visit her website for more! Hey, Rachel! Welcome to the blog and thanks for agreeing to answer a few of my questions. 🙂 To start…is there one character in Dancing & Doughnuts that you like a teeny bit more than all the others? I’ve actually got four favorites in this book, which is unusual for me. I generally have two favorites, but not this time! However, Jedediah Jones is the dearest to me. He’s my protagonist and the narrator, and he has been a delight to write. And a delight to read! I love getting things from Jedediah’s unique viewpoint, especially all those descriptions of doughnuts – they sound soooo good. What’s your favorite kind of doughnut? I love sour cream doughnuts! And these Dutch doughnuts called Crullers that are buttery and flaky. I love both those kinds as well. (No wonder we’re friends. *grins*) So, were there any stories (besides ‘Twelve Dancing Princesses’, obviously) that helped inspire Dancing & Doughnuts? I’ve definitely had Homer Price by Robert McCloskey on my mind for some of these scenes. That book has a wonderful sequence where they have to make hundreds of doughnuts, and I kept thinking about it while my own characters produced veritable mountains of doughnuts. Oh my word, that Homer Price story is one of my favorites. So much nostalgia for me. And speaking of the past…did you have to do a lot of research for Dancing & Doughnuts? I did, actually. I spent a lot of time researching the history of doughnuts to be sure I knew what forms they took in the 1860s. It turns out they were a really popular treat for Civil War soldiers! I also did a lot of research into how long carbonated beverages have been around — people first started adding fruit juice to carbonated water in the 1600s! So fascinating. I also researched dances that were popular in that era, and what dancing shoes looked like. I also looked into when different Christian denominations started congregations in Kansas. And I think my favorite thing that I researched turned out to be the duties of sergeant majors in the Union Army — my protagonist rose to that rank during the war, and is justifiably proud of doing so. That’s a lot of research! (But all completely necessary.) To talk about the actual writing process, though, what time of day are you the most productive, writing-wise? Mornings have long been my very best writing time because my brain is fresh. My mind isn’t cluttered up yet with all the things I need to get done, and I can concentrate better. But these days, I do most of my writing at night after my kids are in bed. Not my favorite time but I make it work. I’ve been getting up earlier and writing and it’s pretty fun. But I also enjoy writing in the evenings, afternoons – pretty much any time is good for me! If you could put your writing aside for one day and spend it with one of the characters from Dancing & Doughnuts, who would it be and why? I’d love to spend a day listening to Jedediah Jones tell me all about his amazing experiences growing up on the frontier and then being in the Union Cavalry during the war. He’s been talking to me for a year now, as he narrates this story, and I can’t get enough of him! However, if I had to pick one character to spend the rest of my life with, it would be this rather marvelous rancher named John Kittredge. I think we could get along quite comfortably for decades. Jedediah and John are both excellent choices. I’d probably choose the same (though I believe Clara would be fun, too). Unfortunately, I can’t keep asking you questions for forever, so I’ll close out the interview with just one more: can you tell me and my blog followers what fairy-tale your next ‘Once Upon a Western’ novella will be based on? I’m really hoping to do Snow White next — set in a wagon train filled with former slaves on their way to new lives out west! But I have a lot of research to do for that one, so I may end up putting it off and doing a different one next. That’s the one I’m hoping to tackle next, anyway! Thanks so much for this fun interview, Eva! Thank you, Rachel! I had a lot of fun with this. Rachel, my kids and I are almost done w/ Cloaked, and we’re hanging on by the edge of our seats. 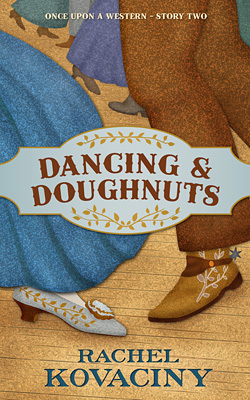 Dancing and Doughnuts will be perfect, too, b/c we’re studying the Wild West and the Civil War, and we love doughnuts. Duh! I have a feeling we’ll be trying some recipes for fun. I saw you tried some recipes on your Instagram…do you have any favorites you could share? I did try a bunch of doughnut recipes from that era. We all really liked one recipe, though I had to tweak it a little to work better with modern cooking styles and modern tastes, and I included that in the back of the book! It’s mostly based on this recipe. That’s a great idea — recipes in the back of the book. Well, I look forward to trying them. 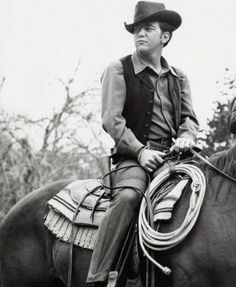 LOVE that you included a pic of Bobby Darin — that’s from a fantastic ep of Wagon Train, btw. If you look closely, you can see he’s wearing handcuffs. I totally have a plot bunny or two that were sparked by that photo, heh. Ooh, another Homer Price fan!